How are you monitoring your building’s energy consumption? As a building owner or property manager, you recognize the importance of energy efficiency. But do you have a good system to measure and analyze its ongoing energy consumption? Do you know how your building compares to others like it? How can you reduce your monthly utility bill? Good news! Energy Star has developed a free tool to help you answer all of these questions. It’s called the Energy Star Portfolio Manager, and it is designed to help you manage energy and water consumption, develop performance reports, and track your cost savings for any building in your portfolio – even for multifamily housing properties. 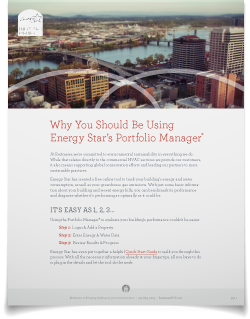 Reitmeier created this easy-to-read Guide for our clients and friends, to help you navigate the Energy Star Portfolio Manager and understand the impact it can have on your business. Just by entering some basic information about your building and current energy usage, you can benchmark and diagnose its performance compared to others just like it. In this guide, we outline the essential benefits to using this free resource, and how you can get started today. At Reitmeier, we’re committed to environmental sustainability in everything we do. And with energy costs on the rise, creating an energy efficient building should be a top priority for any business. Please let us know how we can continue to support you. Click here to download this free resource, or visit www.energystar.gov/benchmark to start using the Portfolio Manager.